Chinese smartphone giants Huawei and OnePlus have been marketing their respective Honor View 20 and OnePlus 6T as flagship killers. Both these phones offer powerful hardware specs and excellent cameras at much lower prices than devices like iPhone XS or Samsung Galaxy S10. 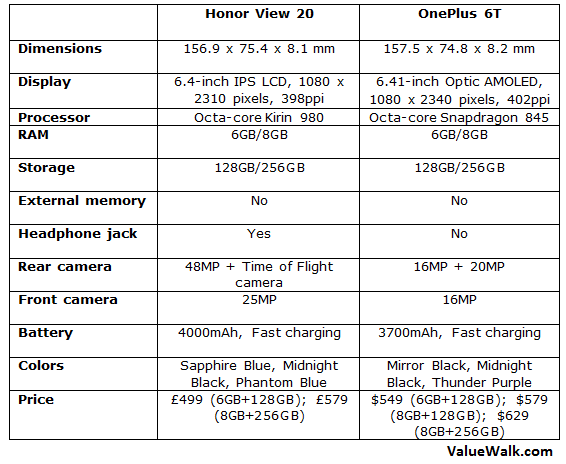 Picking between Huawei Honor View 20 and OnePlus 6T would be pretty difficult. So, here we have compared them in detail to help you decide which one is better for you. The Honor View 20 is one of the world’s first phones to come with a hole-punch camera, beating the Samsung Galaxy S10. It measures 156.9 x 75.4 x 8.1 mm and weighs 180g. It has a glass back with shimmering gradient color scheme. It comes in Sapphire Blue, Midnight Black, and Phantom Blue colors. It retains the 3.5mm headphone jack. Though both the phones have similar build quality, the Honor View 20 is better than OnePlus 6T in terms of design. Unlike Huawei’s flagship killer, the OnePlus 6T has a simple and boring design. It also lacks the headphone jack. It measures 157.5 x 74.8 x 8.2 mm and weighs 185g. It also has a glass back with dual cameras. The front and rear glass panels are supported by an aluminum frame in the middle. It’s available in Mirror Black, Midnight Black, and Thunder Purple colors. For security, the Honor View 20 features a rear-mounted fingerprint sensor, which is reliable, fast and secure but not as convenient as the in-display fingerprint sensor on the OnePlus 6T. The OnePlus phone uses an optical fingerprint reader placed under the display. It’s fast and convenient but not as secure as the ultrasonic in-display fingerprint sensors used in devices like Galaxy S10. The Honor View 20 sports a gorgeous 6.4-inch IPS LCD panel. It has a hole in the top-left corner of the screen to accommodate the front camera. But thanks to its location, it’s barely noticeable when playing games or watching videos. It has an impressive 85.7% screen-to-body ratio, a Full HD+ resolution of 1080 x 2310 pixels, and 398ppi of pixel density. At 479 nits, it’s also brighter than OnePlus 6T. The OnePlus 6T features a superior 6.41-inch Optic AMOLED display that delivers more accurate colors than its LCD counterpart. The screen is protected by Corning’s Gorilla Glass 6. Unlike Honor View 20, it uses a small waterdrop notch to accommodate the front camera. It has an 85.6% screen-to-body ratio, a 1080 x 2340 pixels resolution, and 402ppi of pixel density. It has a peak brightness of 453 nits. Both these devices are packed with high-end specs, meaning you won’t notice any lag while playing games. The Huawei Honor View 20 runs the same Kirin 980 processor found inside the premium Mate 20 Pro. It also uses GPU Turbo 2.0 that gives smoother frame rates while playing intensive games. The Honor View 20 comes in two variants: One with 6GB RAM and 128GB storage and another with 8GB RAM and 256GB storage. There is no microSD card slot for external memory. It also features a liquid cooling system for heat dissipation. In contrast, the OnePlus 6T is powered by Qualcomm’s Snapdragon 845 processor paired with Adreno 630 GPU and 6GB or 8GB of RAM. It comes in 6GB RAM/128GB storage, 8GB RAM/128GB storage, and 8GB RAM/ 256GB storage options. There is also a special McLaren Limited Edition with 10GB RAM, but it’s much more expensive. In terms of battery, the Honor View 20 gets a giant 4000mAh battery with 22.5W fast charging. It promises up to 55% charge in just 30 minutes. The OnePlus 6T packs an impressive 3700mAh battery with its proprietary Dash Charge 20W fast charging technology. Both of them take only a little over an hour to fully charge, and they both deliver more than a day of battery life with normal usage. Both phones run Android 9 Pie with a custom skin on top. The Honor View 20 runs Huawei’s custom Magic UI 2.0 skin rather than EMUI that you’d find on the P30 series. It offers tons of options to customize the interface to your liking. You’d also find some bloatware on the Honor View 20. The OnePlus 6T runs OxygenOS skin, which is insanely fast and has a clean interface. Though it’s a custom skin from OnePlus, it’s pretty close to the stock version of Android. Also, OnePlus is much better than Honor when it comes to rolling out software updates and security patches. The Honor View 20 gets a 48-megapixel primary lens with f/1.8 aperture, and a secondary 3D Time of Flight sensor for depth mapping on the back. It also has AI features in the camera app and multiple camera modes to choose from. Though the primary lens is 48-megapixel, it is set at 12MP by default, which you can change from Settings. On the front, it gets a 25-megapixel selfie camera with f/2.0 aperture. The OnePlus 6T sports a dual camera system on the back. It consists of a primary 16MP sensor with an f/1.7 aperture and OIS. The second camera is a 20MP lens with an f/1.7 aperture. The OnePlus 6T has a 16MP camera on the front for selfies. 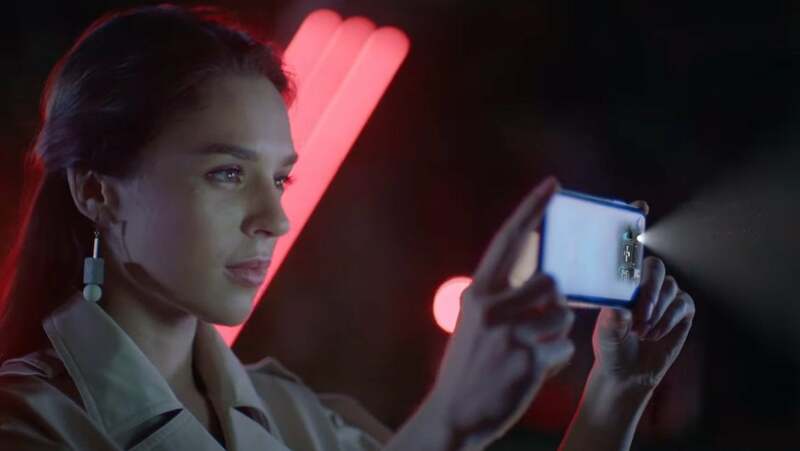 OnePlus uses software tricks on its phone to improve the photography experience, especially in low-light conditions. Both the handsets are flagship killers, meaning they offer premium specs at mid-range prices. Unfortunately, the Honor View 20 might not easily be available in the US due to the political controversy and security threats involving Huawei. In the UK, it costs £499 for 6GB/128GB model and £579 for the 8GB/256GB variant. The OnePlus 6T starts at $549 for the 6GB/128GB model, goes up to $579 for the 8GB/128GB variant, and $629 for the 8GB/256GB model. The US customers can easily buy it from Amazon or directly through the OnePlus website. If you have made up your mind to buy a OnePlus handset, it’s better to wait for the OnePlus 7, which is expected to launch towards the end of May. It would have a faster processor, better camera, and upgraded specs.